What to do With a Leaking Windshield? Repairing your windshield in Pittsburgh before another winter. Is there a whistling sound in your car? Drops of water on your dashboard? Could it be a ghost? Likely, no! And, while we aren’t ghost hunters, we are experts in auto glass and our guess is: A leaking windshield! 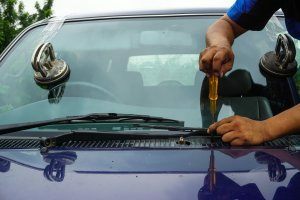 This month, Pittsburgh’s trusted auto-glass repair shop, Three Rivers Auto Glass, is sharing some reasons on why you should consider fixing your leaking windshield, today. As September rolls into October, the spooky chill, of autumn will soon fade to an even cooler November and December once the seasons change into full-winter mode. A leaking windshield may start off as a nuisance but can quickly wreak havoc on your car. Not only will the value of your car plummet, you may be putting your passengers at risk before you even leave your driveway. Let’s look at why you should winterize your vehicle, before it’s too late. With advancements in auto-glass sealants, we’ve seen a decrease in windshield leaks over the years. However, there are still instances where this can occur, especially if the vehicle was, perhaps, used and had a windshield replaced by someone other than the manufacturer. Spray your windshield lightly, with a minimal amount of water. You do not need to totally soak the window as the source of the leak will be more obvious with less water. Blasting your windshield with water will only cause the water to bounce off. In this instance, less water means more accurate results. Much like a deflating tire, a good way to check for the source of leak is with soapy water. All you’ll need is a rag dipped in a bucket of mild, soapy water. Run your rag along the windshield. Get in your vehicle, be sure all the windows are closed and turn on the defrost. Be sure your car is in park, with the emergency brake on, and step outside to look for presence of air bubbles. You’ll be able to spot the source of the leak in no time. Mold, and Mildew and Allergies. OH MY! Not only is a vehicle with a leaking windshield valued less, it can create a dangerous atmosphere for you, your family and friends. Have you, or your passengers, been sneezing or coughing a lot, but only when in your car. While you might not realize it, a leaking windshield is the perfect place for mold and mildew to grow, thus affecting the air-quality in your vehicle. If you’ve noticed an increase in allergy symptoms, it may be due to your windshield problems. Water trapped along the seam of your windshield could freeze and thaw during the winter months. The expanding and contracting of water and ice over time can create a threat of cracking. This will ultimately weaken the windshield, an important component of the car that protects you and your passengers. Even the smallest rock hitting your leaking windshield could further cause a major crack causing major safety concerns or cause an accident. If you have a leaking windshield, now is the time to call our Pittsburgh auto-glass experts at Three Rivers Auto Glass! Let us fix your windshield before allergies and the risk of winter weather pose any more threat to you and your passengers! Call us at 412-385-8204 or 412-793-5400 today!